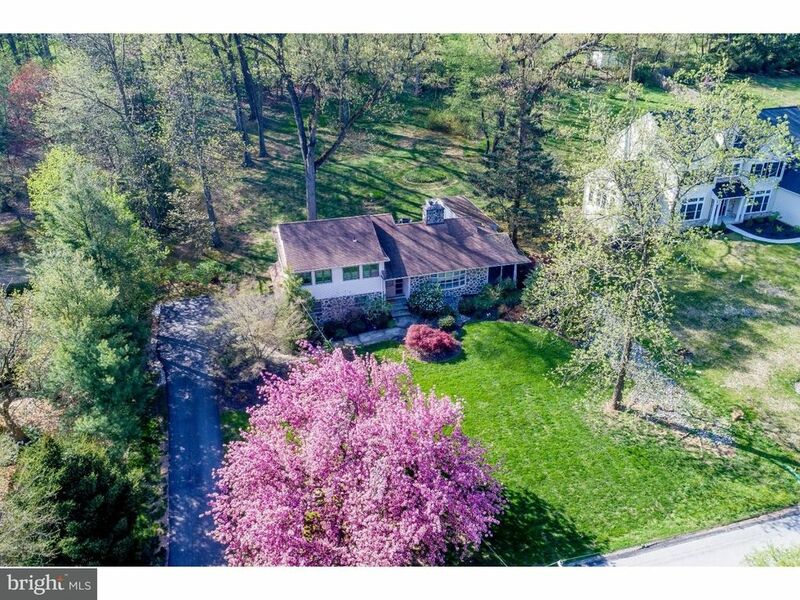 This 3 BD, 2/1 BA stone split-level style home is located in top-ranked Tredyffrin-Easttown School District and features a renovated Kitchen, Master BA, Powder Room, and Rec Room. Stroll up the flagstone path, past specimen plantings to the front Entrance area, which has a coat closet. Gleaming wood floors and a stunning stone fireplace highlight the Living & Dining Rooms, which also have large windows. The remodeled Kitchen features newer cabinets, flooring, appliances, and backsplash. A thoughtful addition created a cheerful Breakfast Room with soaring ceiling, glass doors to the composite rear deck, and a hallway with closet that leads to the Family Room. The vaulted Family Room has wood floors and scenic views of the rear yard. Currently used as a Den, this room was designed so that it could also be a private Office or 4th BD, and has a closet and a nook that is large for a full BA to be added to it. A secluded Screen Porch is located off the Living Room, and has a patio which connects it to the Breakfast Room as well. A new Powder Room is located a few steps down from the main floor, near the interior door to the 2-car Garage. Just a few steps further down is a renovated Recreation Room, with white walls and new grey wood-grain tile flooring. The 2nd floor features a Master BD with a renovated full BA, two more BD, and a Hall BA. Ample storage abounds in the many closets, walk-up floored Attic, over-sized Garage, and unfinished side of the Lower Level. Convenient to shopping, restaurants, train stations, corporate centers, and parks. Easy access to King of Prussia, Schuylkill Expressway, Turnpike, Blue Route, Center City, and Airport.